Combining Xmas Party, Skateboard Exhibition and Art Raffle this is your chance to buy or win one of our range of customised skate decks by members and specially invited guest artists. 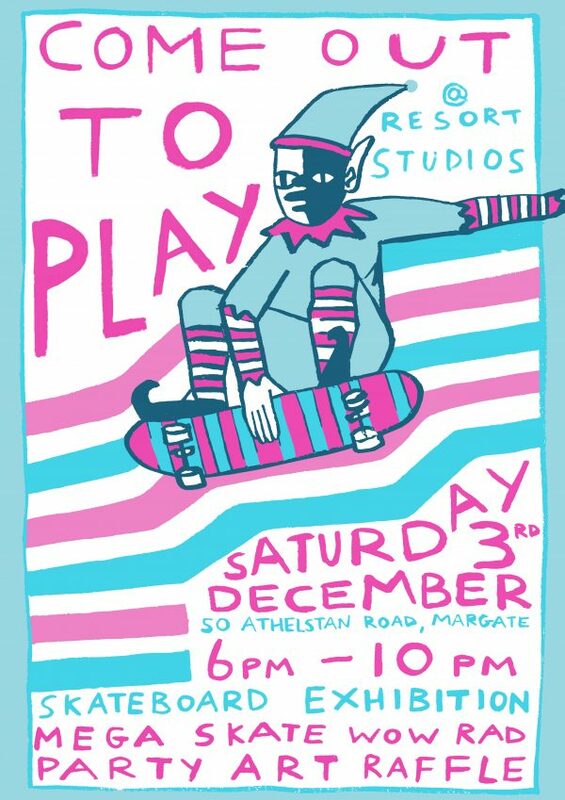 ‘Come out to play’ is a group show of illustrated skateboards by Resort members and Margate artists, supported by local retailer Skate Pharmacy. We’ve asked Margate doodlers to respond to the question: ‘if you were in a Margate gang, what would it be called and what would it look like on the bottom of a skate deck’. Everyone from our coffee baristas and poets to our architects and music heads have put pen to deck. The show will open on Saturday 3rd December from 11am and carry on into the night with Urchin Wines, doubling as a Christmas party for all. Exhibition continues during Urchin Wines opening hours on Sunday 4th and Monday 5th December. The works will be on sale for £75 each with 3 boards to be raffled on the night. We would really appreciate your support as a way of raising much needed funds as Resort looks to grow its public programme into next year. The used decks have been kindly donated by Skate Pharmacy, so check them out or visit them in store.